Installing a beautiful water garden is only the beginning. Atlantic offers a full line of maintenance products that will keep your water feature healthy and beautiful for years to come. Our bacteria, dyes and pond treatments keep your pond crystal clear, while seasonal products protect your water feature when the weather is less favorable. Whatever your maintenance needs, Atlantic has you covered! Microbe-Lift barley straw products help naturally eliminate green water & string algae throughout the season and is available in liquid or pellets. Our range of pond dyes and colorants safely color pond water with added enzymes that contribute to the ecosystem and inhibits algae growth. All our pond products are safe for plants, fish & wildlife. Pond bacteria naturally removes sludge, odor, debris and decaying leaves with billions of bacteria colonies and in some products enzymes. The result is a cleaner pond, healthier fish,improved dissolved oxygen levels and reduced ammonia levels. Some pond bacteria blends contain activated Barley and m these ingredients help to remove and control sludge, odor, grime & debris. With so many bacterial and clearing products available we offer only the best available in America. Eco-Solv9 is the fastest and most efficient water clarifier on the market today. 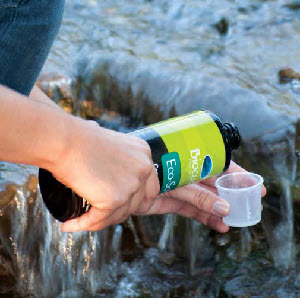 Eco-Solv9 is designed to clear pond water in all sizes of ponds, fountains, bubblers and streams. Eco-Solv9 contains a 9% solution of active product that is double that of competing brands, which allows you to use less per application. In fact, one 16 oz. bottle of Eco-Solv9 treats 9,600 gallons. So no matter what you clarity problem is, Eco-Solv9 can help you FIX it. We carry sludge removes, nitrification enhancers, oxygen based cleaners to help with common pond problems like algae odors and poor water quailty. Alpha Chemicals Brand. Shipped in 2 - 5 lb resealable bag that is sealed for safety and freshness. I..
DyneAmic is a high quality non-ionic surfactant that greatly enhances the effectiveness of Herbicide..
Removes pond scum and odors: Eliminates fish wastes and ammonia. Digests organic compounds and assis..
With the Highest pure dye actives of all EPA registered lake colorants, Admiral aquatric weed contro.. Most water problems are invisible to the eye. Quickly measure and modify the six aquarium levels tha..
Keep your fish healthy and thriving by testing your aquarium water's PO4 3- levels regularly with th.. The API POND 5 IN 1 TEST STRIPS Pond Water Test Strips provides everything you need for regular test.. The API POND MASTER TEST KIT Pond Water Test Kit provides everything you need for regular testing of..
A lack of electrolytes in pond may cause serious health problems for fish. API POND SALT supplies el..
Keep your fish healthy and thriving by testing your pond water's pH regularly with easy-to-use API P..
API POND-ZYME SLUDGE DESTROYER Pond Water Cleaner with Barley reduces build-up of fish waste and con.. Treat your tap water, and provide a safe environment for freshwater fish instantly and easily with A..
A wetting agent, sticker, and penetrate all in one. The product helps break down the waxy cuticle on..
" A granular chelated copper algaecide. - Controls algae before it reaches the surface. - Ideally su..
Use in natural and manmade ponds, lakes and fountains. Colors water a pleasing aqua-blue, enhancing .. Does your pond look like pea soup? TURN YOUR GREEN POND CLEAN! Winner of Pond Trade Magazine's 2011 ..
Aqua Meds Arctic Blend 32 oz. Arctic BlendTM beneficial bacteria winter fish pond care prevents poor winter pond water conditions,..
AquaClearer Extreme Cold Water Liquid has been replaced with Cold Water Beneficial Bacteria/Liquid a..
Koi Medic Salt Meter is an electronic test that is specially designed to measure and monitor the sal.. The second-generation Aquascape IonGen System electronic water clarifier for ponds, pondless waterfa..
Aquascape Natural Pond Tint creates beatiful natural tea color pond water. It contains humic acid an..
Triton Ionizer Test Strips test for alkalinity, pH and copper in your pond, pond-free or fountain ap..
Beckett Water Treatments Pond Clarifier. For use in all ponds.Clears cloudy waterDetoxifies some he..
Aquascape Beneficial Bacteria now contains 8 pure strains of concentrated beneficial bacteria, inclu..
Biosafety offers green solutions for a broad range of disease control. Bio safe systems Green clean ..
BioSafe Systems 3015-20 GreenClean Granular Algaecide, 20 lbs. Through the power of oxidation GreenClean Granular Algaecide breaks down algae cells on contact, you..
WHERE TO USE: GreenCleanFX Liquid Algaecide is designed for use in Water Gardens, Koi/Fish Ponds, Or..
Prime, 2 L / 67.6 fl. oz.